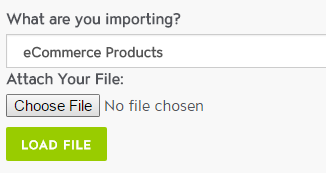 You can import your entire product catalog and even keep it updated via our import engine. Export your existing products into a CSV file. Setup the field names in the first row for each column. For example if you want to import the product SKU set the column name in Row 1 to Product SKU. Once your data is in a CSV, you will need to setup the custom attributes that you would like to apply to the products. This is additional data that you would like to filter products or display to your buyers. (see below to add attributes). You can select to auto-map data which will try to match to PeopleVine fields (see list below). 6. Your products will then import into the system, setting up any category, pricing, inventory, photo and more. *If you are looking to update your products, make sure you map the Product SKU field, this is used to refresh your data vs. creating a new record. Go to the Company Menu and click on Setup New Attribute under tagging. Select product under the Used For section. Select the type of field, where certain ones are used for input and labels are used for filtering. Select the settings that apply and hit create. Once you're done with creating your attributes, you can now import your products. Please note, if you name the Attribute Label the same in your spreadsheet, it will automatically map this on import. product_weight - Proudct Weight in lbs.